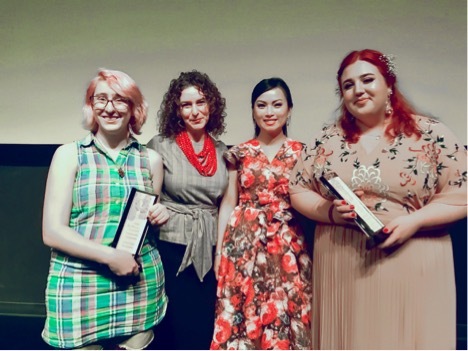 (Picture) SVA Film & Animation Dusty Awardees Emilie Simonini (far right) and Kira Clines (left) with NYWIFT Board President Simone Pero and philanthropist Ha Phuong at the May 2018 Dusty Awards. Photo courtesy of NYWIFT. New York Women in Film & Television (NYWIFT) is delighted to announce the latest recipients of NYWIFT Scholarships and Awards. With support from the Ha Phuong Foundation this year, the newly re-branded NYWIFT Ha Phuong Scholarships provide a $5,000 scholarship each year to a second-year female film student at the Brooklyn College Feirstein School of Cinema, City College of New York, Columbia University, New York University, and the Stony Brook/Killer Films MFA in Film program. Prizes for $2500 each are also given to two undergraduate students from the School of Visual Arts. On May 8th, 2018, Ha Phuong was accompanied by NYWIFT Board President Simone Pero to present the prizes onstage at the Dusty Awards. The Dusty Awards are the peak of the SVA’s Dusty Film and Animation Festival, an industry showcase of the work of BFA Film and BFA Animation students. Emilie Simonini (BFA Film) and Kira Clines (BFA Animation) were granted the awards. The Ha Phuong Foundation is one of the largest of its kind and was founded by Vietnamese actor, singer, writer, philanthropist and NYWIFT member Ha Phuong (HP), as a result of her passion for music and her fierce devotion to supporting young people’s causes. The financial assistance provided by these scholarships allows these future media makers to pursue their own projects, while also giving them access to the one-of-a-kind networking and professional development opportunities for which NYWIFT, the preeminent entertainment industry association for women in New York, is known. Past scholarship recipients have gone on to diverse and illustrious careers. Since its inception, the Scholarship Fund has provided assistance to nearly 60 students. In addition to the NYWIFT Ha Phuong Scholarships, the NYWIFT Sabrina Wright-Gilliar Scholarship, named for the legendary props master, is awarded to a female high school senior graduating from the Academy for Careers in Television and Film (TvF). This year’s scholarship was presented to Giselle Arellana at the school’s graduation ceremony at Symphony Space on June 26th, 2018.